Learning how to cook in general and then learning how to cook on a budget, consistently and with rug rats in the kitchen are two entirely different beasts. My mother is a GREAT home cook and also incredibly thoughtful. As such she sent me off to college with a small laminated booklet of tried and true family recipes. They were simple recipes for lasagna, chicken pot pie and banana bread among others. Classics that I saw on the dinner table frequently growing up. I looked at it exactly once in my four years at UGA. As a college student I ate Chick-fil-A and turkey sandwiches. Every once in a while I made tacos. I was very busy taking 12 hours of classes a week and loitering at the Georgia Theatre, so I didn't learn to cook until I got married and even then, it wasn't cooking as I now know it. As a newly-wed with no kids, I didn't HAVE to cook all that much, and when I did it tended to be a recipe from a magazine that "looked fun." If I didn't feel like cooking, we went out to eat, no problem. Cooking isn't my husband's thing either, so if I wasn't doing it, it didn't get done. Then one day we had a baby. And I realized sadly that all my years of making random recipes from Southern Living had added up to a girl who had no clue how to roast vegetables or prepare a whole chicken. I needed recipes that were healthy, affordable and that could be prepared with a baby on my hip or during nap time. I was totally out of my depth and quickly overwhelmed. This post from 5 years ago proves it. All those years ago my mom had tried to pass on something truly valuable: When you're short on time and money, simple cooking is better than no cooking. By the time I had two kids underfoot, I knew I had to figure this dinner thing out and got back to basics. I read a few books on eating (and cooking) well. I picked out about 2 dozen meals that were simple and that both B Daddy and I enjoyed. I started making them consistently and learning how to put them together without recipes. I learned how to roast a chicken and how to bake bread. I figured out my favorite ways to cook seasonal veggies. And now, after 4 years of practice, I get a homemade meal on the table 5 to 6 nights a week. We usually come in close (enough) to our grocery budget. And truthfully? I usually enjoy the process. You guys have asked how I manage the dinner process nowadays - so here it is. Analyze this chart y'all. Recognize when you're not in the mommy zone and get the heck outta there. The Mommy Zone is life-giving. Stay in the zone friends, stay in the zone. Dinner does not need to be re-invented every week! All those years I spent pulling recipes out of magazines were close to wasted as far as developing decent kitchen skills went. Write down a list of staple dinners that your people love to eat. My list has 23 meals on it and I use it weekly. Hypothetically I could make dinner off this list all month long and never repeat a meal. Sidenote: if you haven't already, take a look at the graphic above. 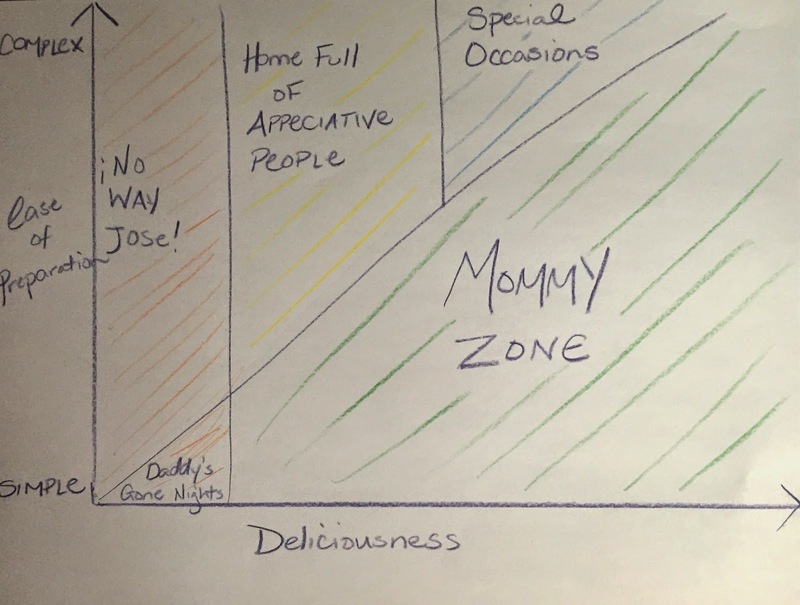 If a meal isn't in the "Mommy Zone"...it does NOT make your Master Meal List. I put all meals through this mental rubric before serving them. Things that are simple but not delicious (hot dogs and mac n cheese) are served when daddy is out of town or when we (the adults) have a date night, small group, etc. Anything complicated but not delicious will never be made again. Things that are somewhat complicated but super yummy will re-appear in my arsenal once my little people are old enough to appreciate good food and say thank you. Things that are divine but time-consuming are special occasion only around here. The other thing I did was assemble my "Master Recipes" all in one binder. This took a while, but every time I used to start dinner, I was either pulling out a cookbook, grabbing my computer or flipping through old magazines (clearly I am not a fly-by-the-seat-of-your-pants chef). Once I started making these Master Meals, I re-wrote them on index cards and slid them into a photo album. Now they are all in one place and it cuts down the time I spend meal planning. Meal planning is kind of a 'thing' these days and you can spend a lot of money using someone else's system to do this very simple thing. At it's heart meal planning is a list y'all. Once you know your Master Meals you're 75% of the way there. Pick a time that works for you - for me it's in the car right before we walk into the grocery store, because my children are strapped into place and any crying/wailing/screaming that ensued upon entry into the car has usually subsided after the 5 minute drive to the store. I think specifically about the week ahead of me, note anything that will disrupt dinner or mean a specific meal is needed and then pick out meals to fit the upcoming week. On the night we have small group we usually have pizza, frozen or homemade. 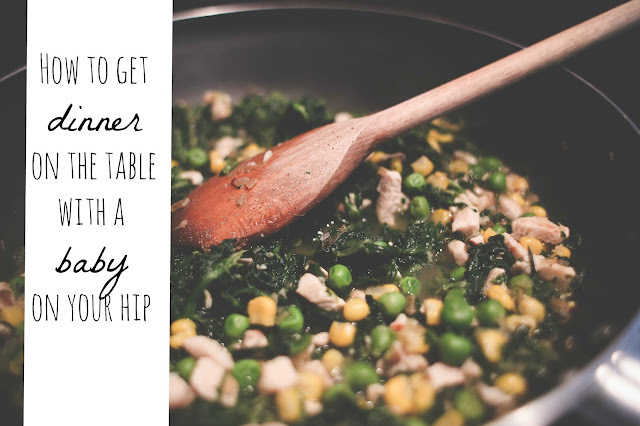 If I know I have a really busy day, I choose a slow cooker meal or something that I can start in the morning and let sit most of the day, like soup. One day is usually given to leftovers. I created this grocery checklist to make my shopping trip simpler. All of the ingredients I use over and over again are on it. I keep a copy in my junk drawer in the kitchen and check a box if I run out of something during the week. Come grocery shopping day, I pull it out, check off the items I need for the meals I've planned to make and it's off I go. Feel free to download and print it off, or use it as an example and create your own checklist. Plan the work, work the plan. If you stick to your Master List for a while and make the same dishes over and over again, you figure some things out. Your family likes your chili spicier. Your kids won't eat the fancy dinner salad, but they will eat it deconstructed (this was a mind-blowing discovery for me) I tweak ingredients and try different versions of recipes for the same dishes until we land on a version that is a crowd-pleaser (or at least an adult pleaser). Now I can confidently pull off a lasagna or a stir-fry when it's requested because I've made it dozens of times. And even though I'm not making a huge variety of food, my husband and I are happy having a solid dish that I've 'perfected' once a month. Professional chefs generally specialize in one type of cuisine, shouldn't home cooks do the same thing? I would love to know how you manage to get food on the dinner table and what works for you! Thanks for the link to this! I NEEDED this right now because I am spending way too much time in the kitchen. I like your system. I'm going to copy you! What do you do for lunches? Stick to Sandwiches? I'm the mom of 2 who is always looking for something new and yummy to cook...but I can't do it anymore. It's too time consuming. With BSF leadership and homeschool starting next week...along with thoughts of opening the door for a 3rd child if the Lord allows, it's time for my meal planning system to change! Thank you for the added humor as well. :) My daughter is a pretty good eater...but my son is terrible. He's tiny and getting him to eat is a huge and stressful challenge.